Kids love to draw. Set out a stack of paper and a pencil and you’d be hard pressed to find a child who doesn’t want to start doodling. So how about translating the concept of a line into 3 dimensions? 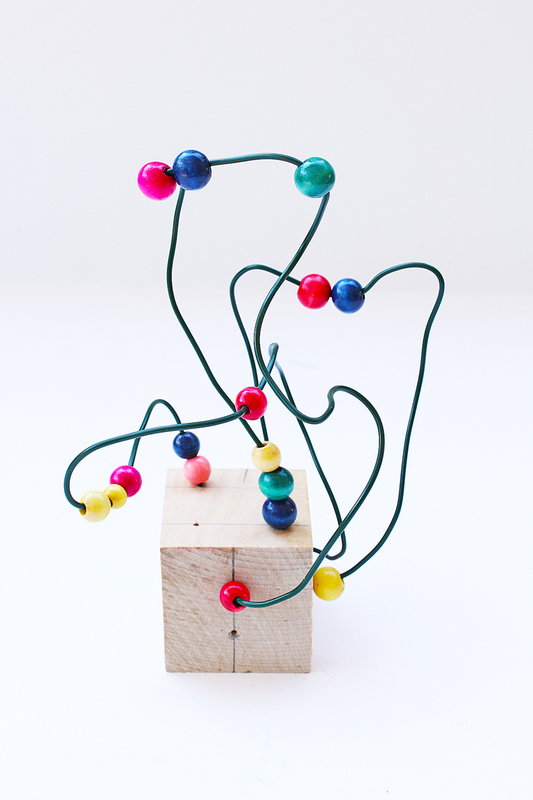 Wire sculpture is an easy way to introduce two important art concepts to children: line and space. Line is an intuitive and basic art concept, in fact the most primitive works of art, such as cave paintings, are line drawings. Line allows people to express ideas in a simple way, think happy faces and hearts, and is the foundation of symbols. Another basic art concept is space. Many 2 dimensional works of art typically employ depth and perspective to create the illusion of 3 dimensional space. Once you start working in 3 dimensions you have entered the world of sculpture, which allows you to actually create objects in space. What I love about wire sculpture is that it allows children to work in line while also exploring space. Additionally it illustrates how 3 dimensional objects look different depending on the angle of the viewer. This was one of those simple light bulb projects I had while fooling around with materials I had purchased for something else. 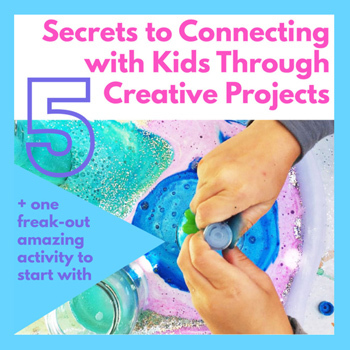 At first I envisioned them as DIY toys, which they still can be, but I also enjoyed the idea of using them as an easy sculpture exercise for kids. 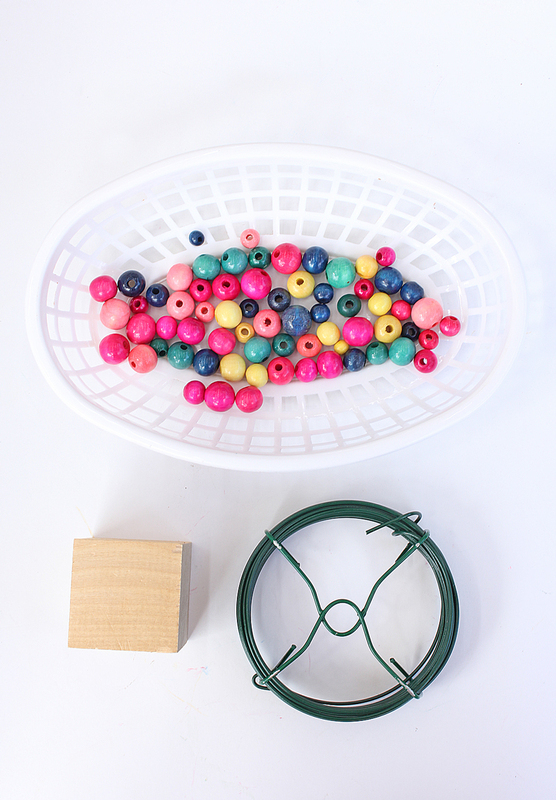 The beads add color and actually help children “trace” the 3D lines they’ve made. 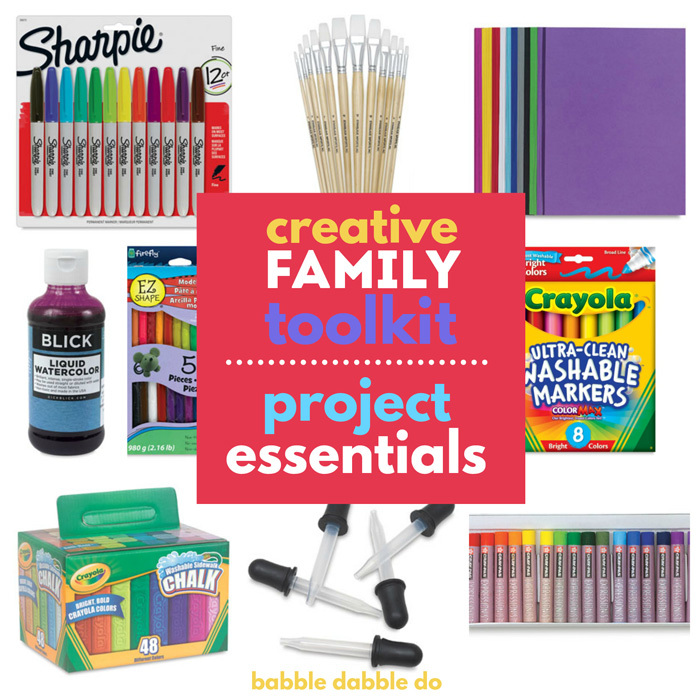 And there’s a bonus, it’s a really easy and inexpensive project to set-up! Wood blocks like these– you can also recycle a few wood blocks from your toy collection. You will want to use blocks on the heavier side. I actually used 2″ square blocks. Step One Start by taking your wood block and laying out the location of the holes that will act as the wire base. If you are using a square block, mark out hole locations on all of the exposed sides of the block. If you are using a larger flat block then go ahead and mark holes primarily on the top side. Step Two Drill hoes in the block using your drill bit. Sand any rough edges as necessary. Step Three Cut strips of wire. I recommend the lengths be between 12” and 18”, you want there to be enough wire to twist and loop but not so much that the wire becomes unruly and droopy for little hands. Step Four Set up the activity for your kids. 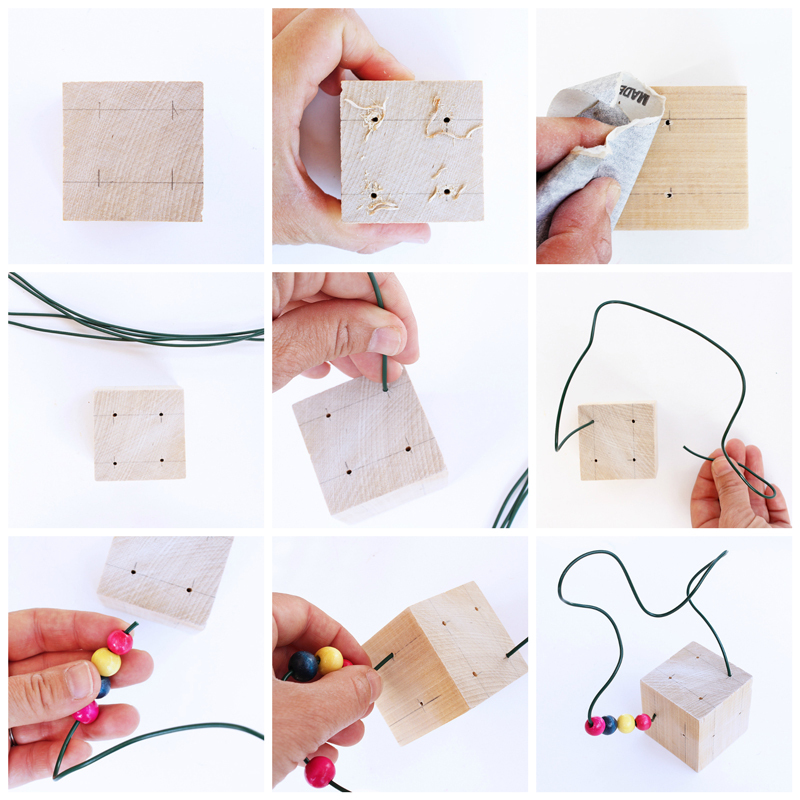 Each child should have (1) wood block with holes in it, (3-4) strips of wire (a few different lengths would be great), and a handful of wood beads. Step Five Have your child place one end of the wire in one of the holes, add a few beads onto the starting end and then ask them to twist and shape the wire as desired. Place the loose end in another hole. 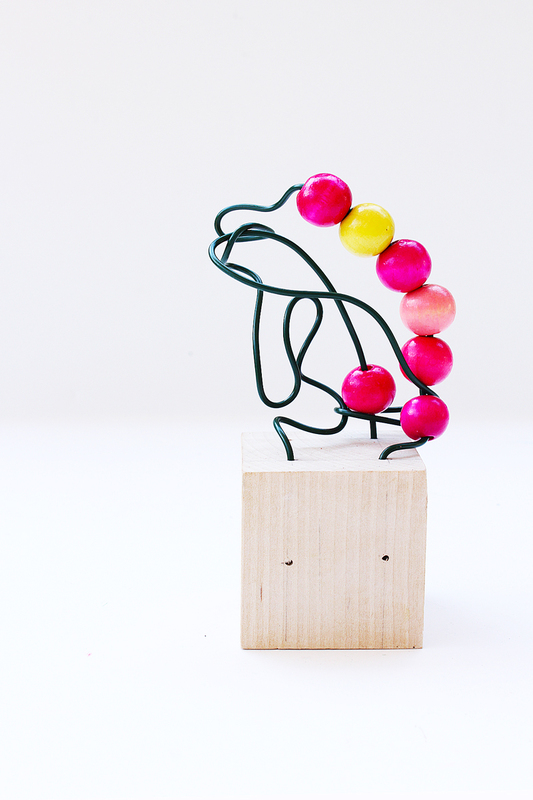 Step Six Repeat step five with additional lengths of wire to make a sculpture/DIY bead toy. You’re done! Simple and fun! Kids can place both ends of the wire in holes and twist and shape the wire with two sides firmly secured. You can permanently secure the wire in place by placing a small dollop of wood glue in the hole before inserting the wire. This can also be done once the sculpture is complete, simply pull out the wire, add glue to the hole, and replace the wire. 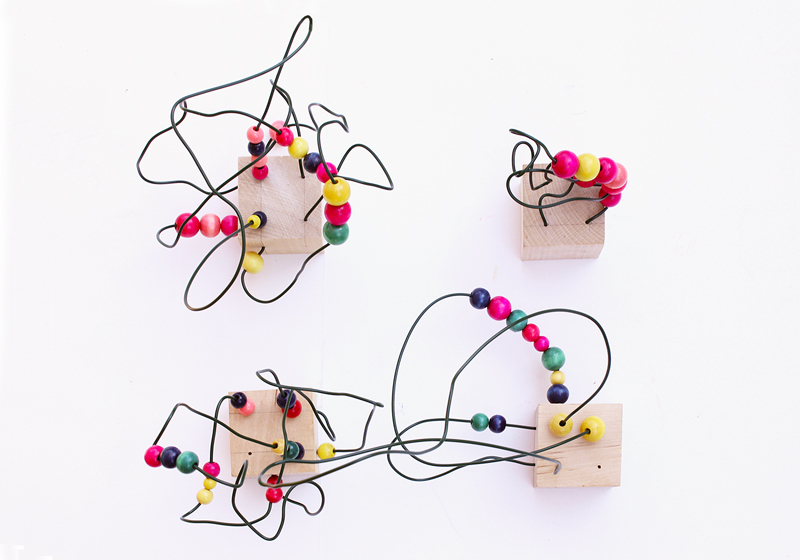 Try sliding the beads along the wire for your very own DIY wooden bead and wire maze. David Oliveira. David Oliveira is a Portuguese artist who makes 3 dimensional wire sculptures that look like sketches. They are absolutely incredible and show you the power of the line to suggest form. His sculptures prove that a humble medium like wire can be used to create fanciful and expressive works of art. Check out his work here on Saatchi.com. Wire sculpture is a wonderful 3 dimensional “drawing” exercise for kids. I’m reading this amazing book right now, which inspired me to think about wire as a medium for exploring line. 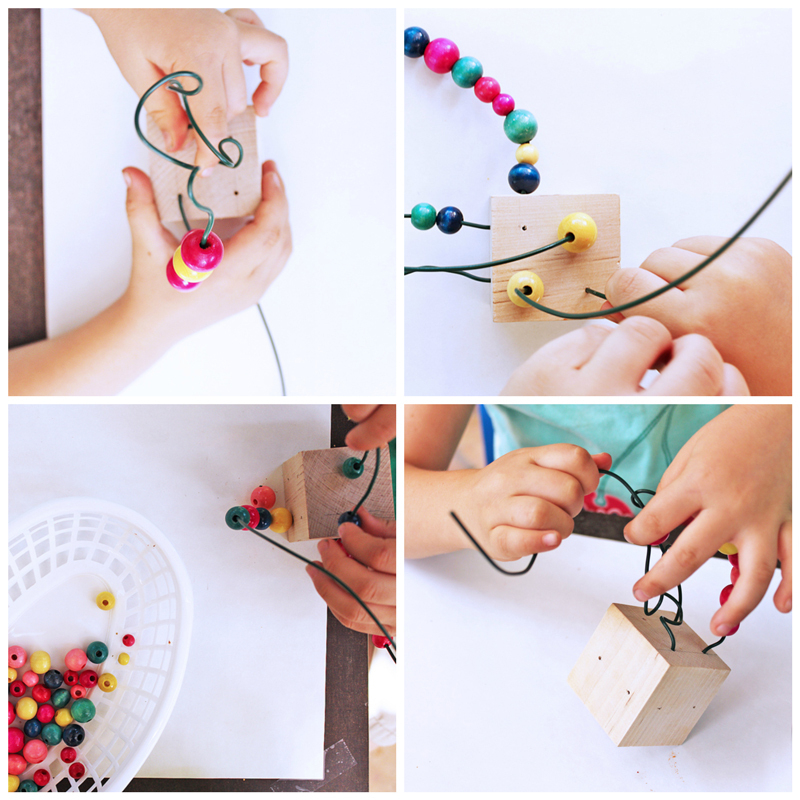 Wire is so easy for kids to manipulate, and adding colorful beads makes the sculptures pop and allows children to make sense of the 3D lines they are creating. 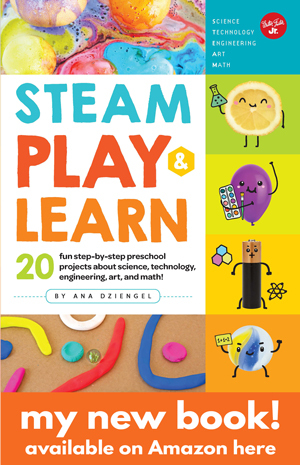 I can also see this project translated into a fine motor skills activity for the preschool set. And not to mention the final sculptures also make some sweet retro art for your house! 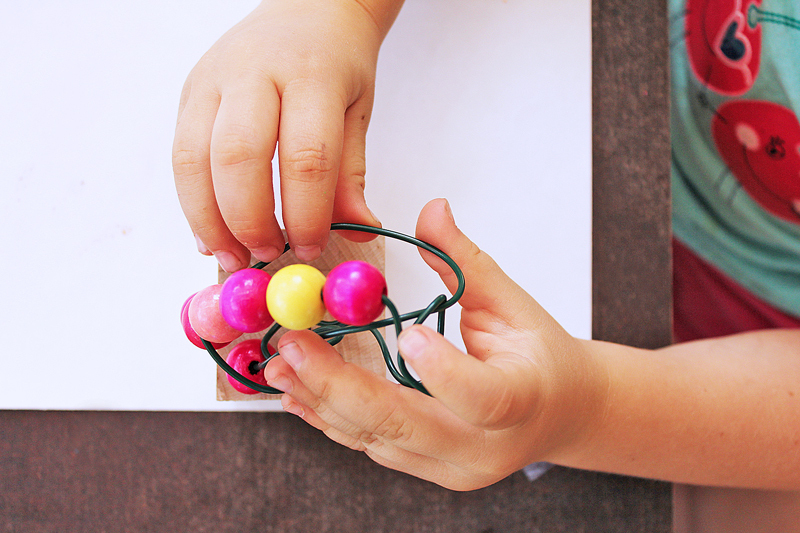 If you enjoyed making 3D sculptures with kids check out our Magnetic Sculptures project. For more easy art ideas for kids using simple materials try Watercolors and Oil and Styrofoam Patterns. beautiful pics and super fun project. I love working with wire! We do too, Meri! It’s so open-ended! Very cool project and so nicely explained. I like that the final result can continue to be played with too, very appealing to kids, sharing! Ana, I have another new favorite here!! I just love, love, love these!! So cool! This is so great! 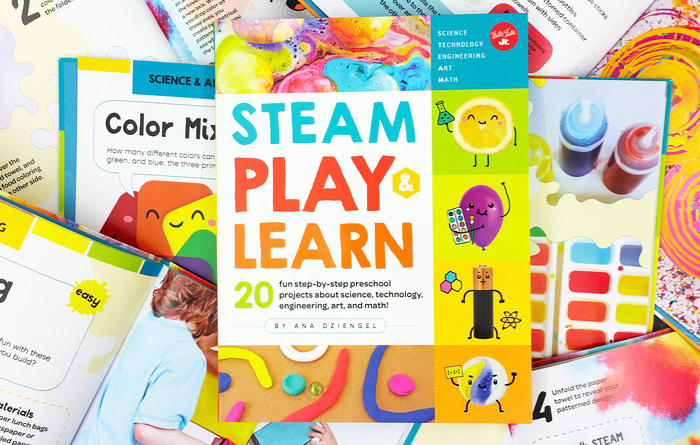 I used to do a similar project with my students when I had an art studio. I love your idea of drilling holes in the wood and using different sides of the cube. I gave my students a flat piece of wood and let them hammer nails in so that they could wrap the wire around the nails. This also allowed them to hammer pieces of paper and other decorations to their wood for an added collage project. Wow Megan! Lovely results! I love your blog too!!!! Ana! The new design on your blog: Perfect! This project is just as exciting;) I dont own a drill so i’m going to improvse–I’ll link you up once completed. Jeanine, Oh thank you so much!!! Can’t wait to see you are sculptures,too!